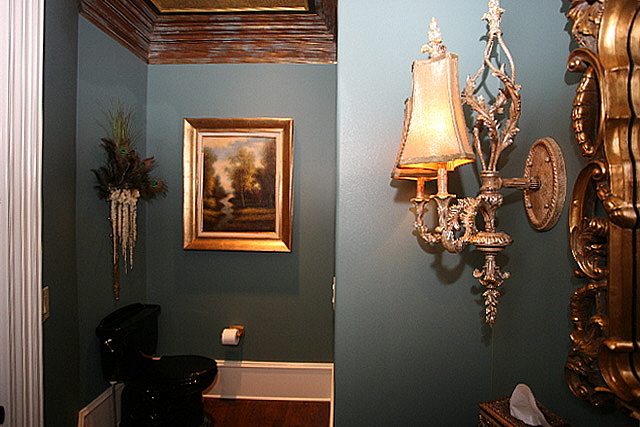 In most cases, a powder room is a small square room in need of some personality. But, in this case, there were many distinguishing architectural details. 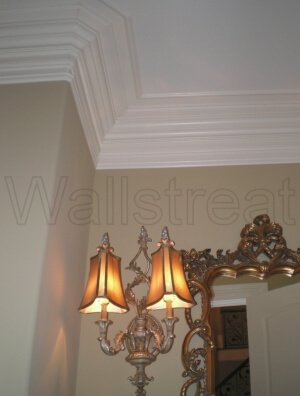 One wall is curved, the ceilings are very high and the trim molding is extremely bold. The objective was to draw your eye to all of THESE beautiful features. Innovative use of faux finishes was the perfect solution. We focused our attention upward . . . When spaces are small with very high ceilings, it can create a feeling of being at the bottom of a well. 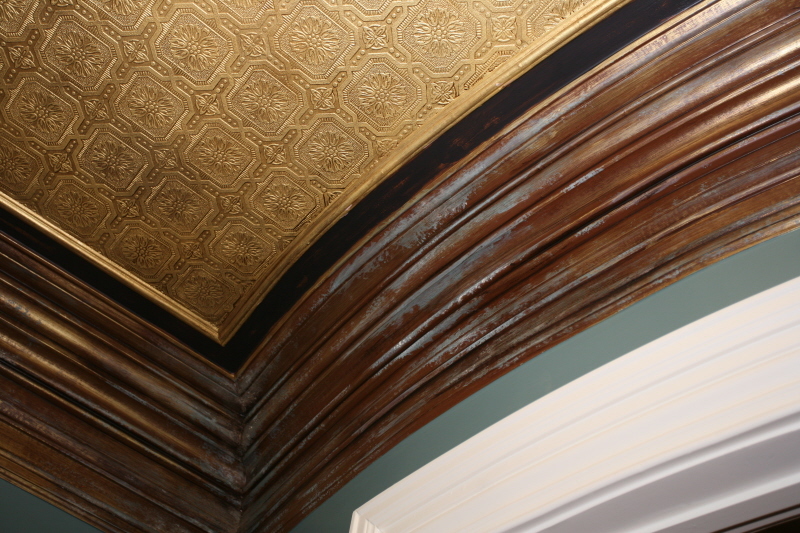 Our goal was to visually lower the ceiling by accentuating the details up above with multiple faux finish treatments. 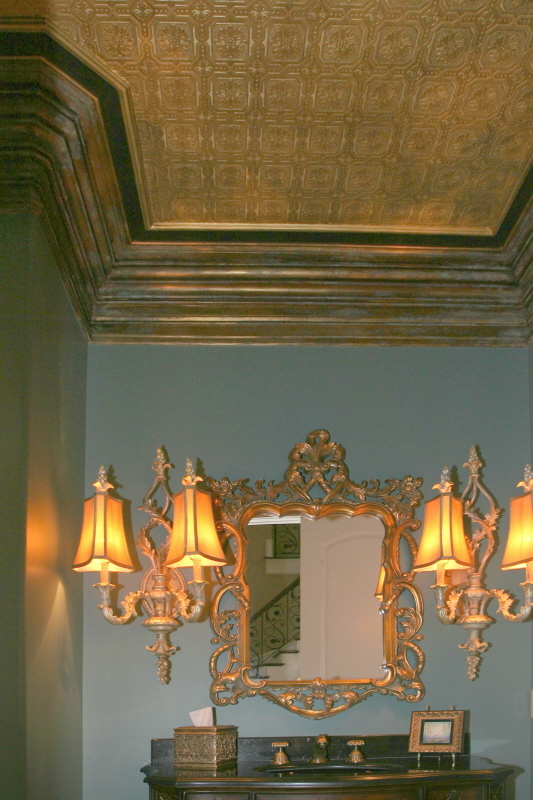 First is a rich metallic gold texture that is consistent with the mirror and fixtures. Distressing the exquisite trim mold ties in with the largest piece in the room, the vanity. 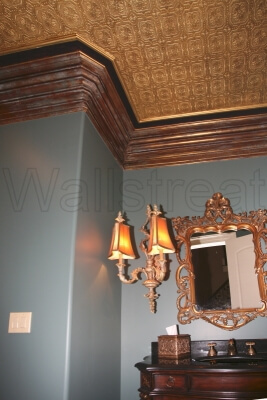 It was enhanced with an aged and dimensional patina that also honors the restful teal wall color. A distressed black line around the edge is a clever way to emphasize the unusual shape of this space. The walls remain a crisp clean palate . . . the perfect backdrop for elegant artwork and accessories. Experiencing this room is candy for the eye from every vantage point. As a special space for guests, this powder room is like offering a beautifully wrapped present with a thoughtful but unexpected gift inside. 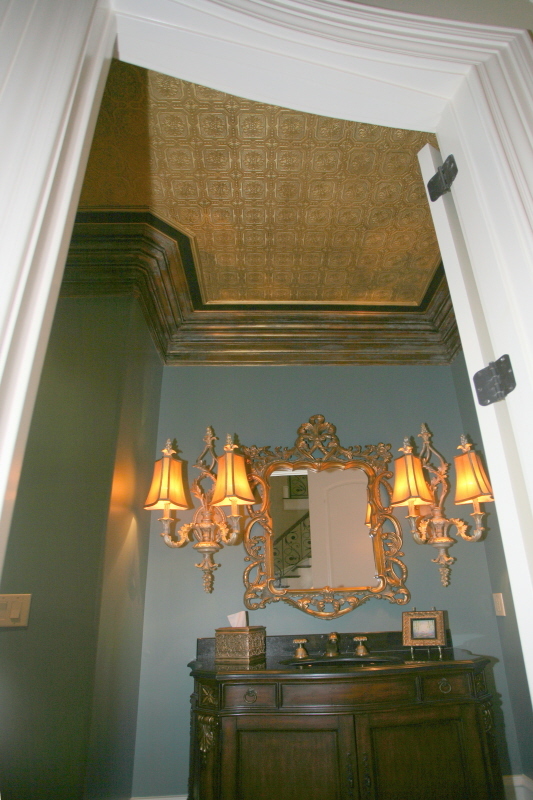 The next time you enter YOUR powder room, take a moment to look up. Do you see an opportunity to make it special? Let me know! Special thanks to designers Joann and Kelly of Kandrac and Kole Interior Designs Inc., www.kandrac-kole.com, for this wonderful project. Wow! !What a transformation! It has the effect exactly as you said – of bringing the high ceiling down so the room feels more personable. 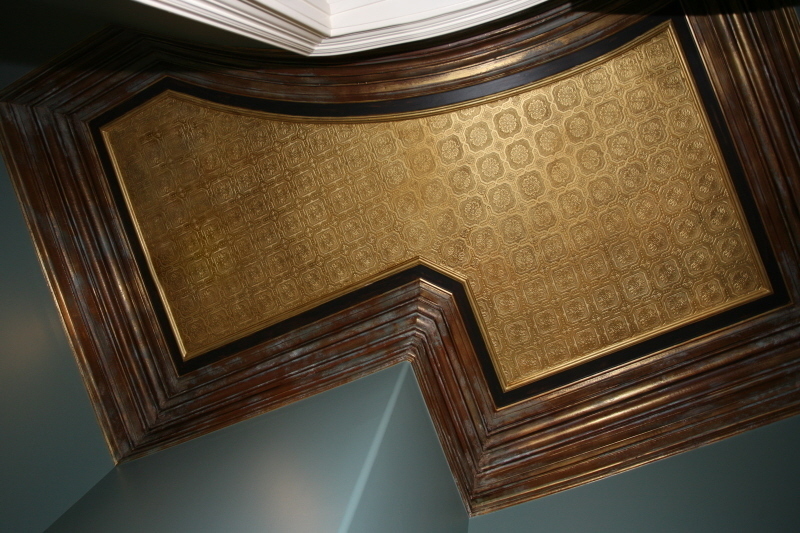 I love the detail on the moulding! STUNNING! !